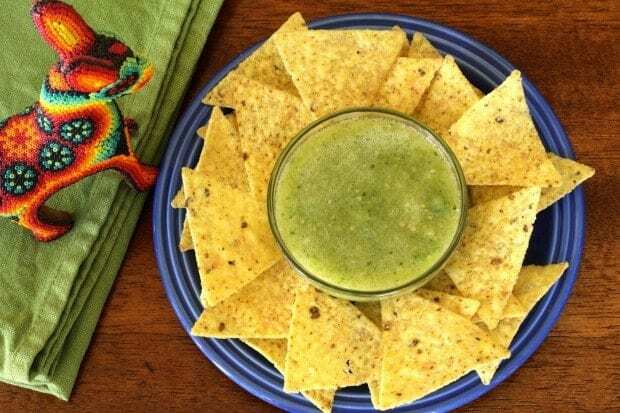 This easy salsa verde–green table sauce–is a bright blend of green tomatillos with cilantro, serrano chiles, onion, garlic, and a little bit of salt–that’s all! 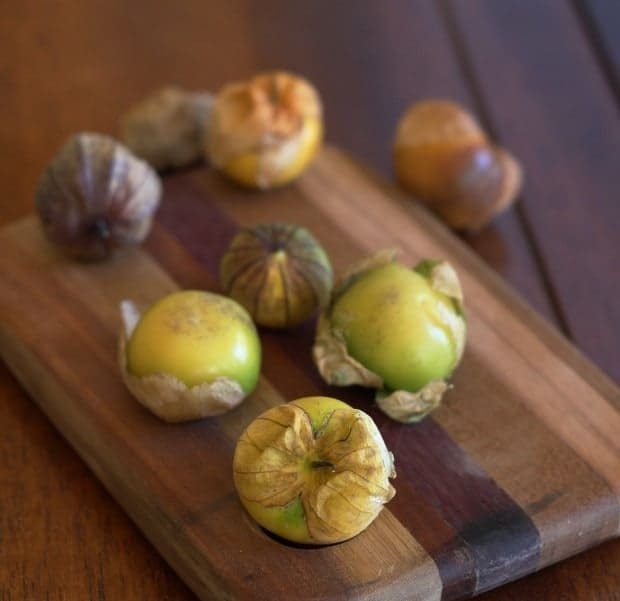 Tomatillos (toe-mah-tee-yos), little citrus-y tomatoes hiding in a paper thin husk, are the primary ingredient in green Mexican sauces. 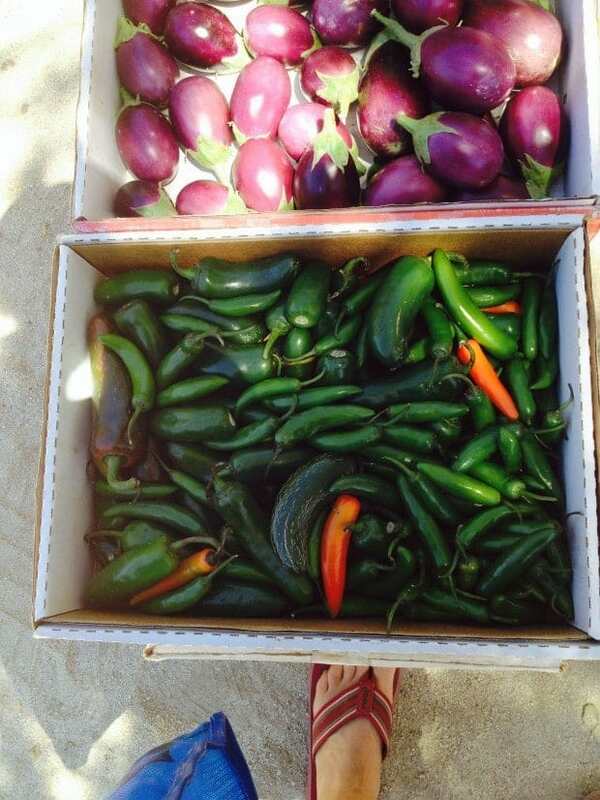 Mexican green salsas differ in their ratios of chiles to tomatillos. Serrano chiles with their bright fresh flavor and are first choice for this green table salsa. If you substitute jalapeño chiles your salsa will be remarkably different in flavor, though excellent as well. For some salsa verdes, the tomatillos, chiles and onions are charred first. 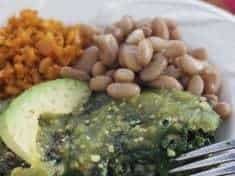 If cilantro is not your thing, you might want to try this green tomatillo sauce that I serve with spinach patties. 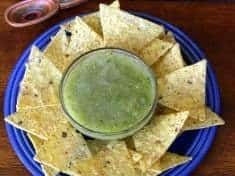 This spicy green tomatillo sauce is considered a raw salsa verde and is perfect for chip dipping. Thought it’s not just for dipping, try it with eggs and grilled veggies too! 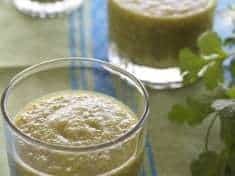 This other salsa verde is considered a green enchilada sauce and it’s the perfect sauce for vegetarian spinach and arugula enchiladas! This is salsa, so don’t skimp on the chiles–you want salsa to have some picante heat! Taste and add more if the chiles are mild or you like spicier salsas. 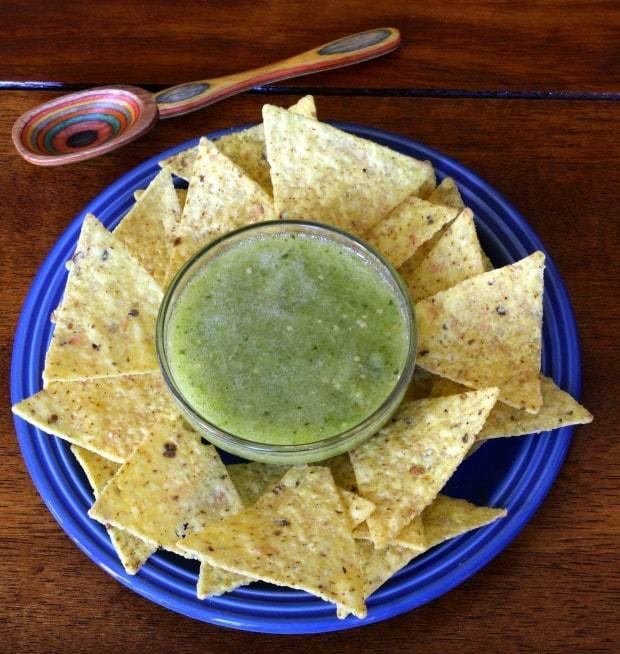 Because tomatillos have a high pectin count, raw salsa verde jells and thickens. Thin with water if after a day or so the sauce thicken more than you want. 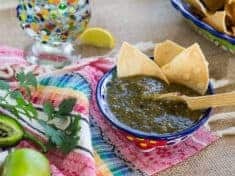 Serve your salsa verde–green table sauce–with brilliant red hibiscus margaritas and you’ve got yourself a party! This post contains Amazon affiliate links. If you purchase a product via my links, it doesn’t cost you anything and I earn a tiny commission, which helps defray the costs of Letty’s Kitchen blog. Thank you for supporting me. 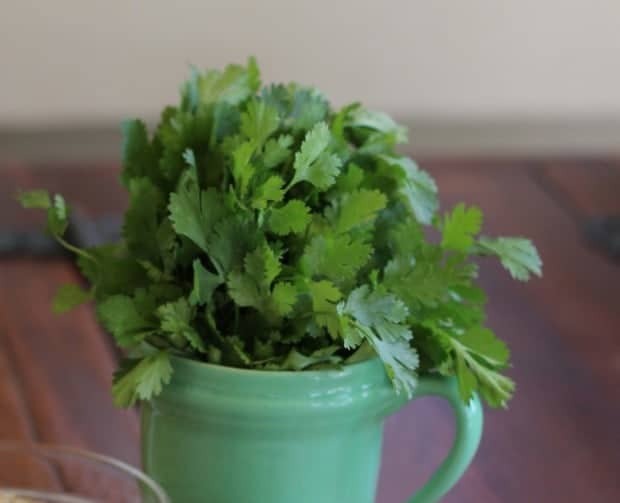 This easy green salsa is better than any you can buy in a jar. Serve with tortilla chips. 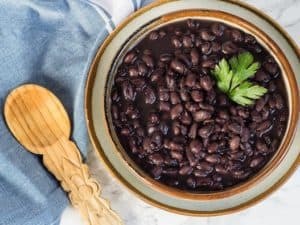 It's absolutely delicious as a sauce on eggs, enchiladas, tacos, tempeh, grilled meats, and vegetables. Makes about 1 1/2 cups salsa. Remove the papery husks from the tomatillos. Rinse to take away the sticky residue—you will know what I mean when you feel it. Place the tomatillos in a saucepan and cover with water. Cook until the tomatillos are just soft, about 5 minutes. Place the softened tomatillos and about ½ cup water in a blender jar. Cut the top off the serrano chiles and cut them in half lengthwise. Scrape the seeds away unless you like maximum picante heat. (Grapefruit spoons are the perfect utensils for holding chiles while you scrape.) Chop coarsely and add to blender. Add the onion, garlic, cilantro, and salt. Puree until the sauce is smooth. 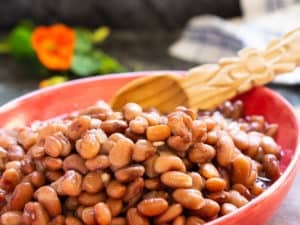 Taste and add more chile and/or salt if needed. I just saw a jar of guacamole spices–Frontera brand, at the store. The ingredients are tomatillos and chiles–basically my salsa verde recipe.